The traditional culture of India comes to life in this richly descriptive novel of an independent young woman coming of age. 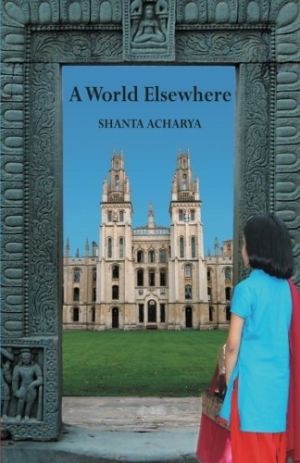 A World Elsewhere begins with the very pregnant mother of the protagonist awaiting the birth of her expected daughter, now one month overdue. The delayed birth is the talk of the family and the neighborhood, and when she finally arrives, the narrator remarks it is “as if the female child, knowing the perils of the world, was delaying her arrival.” The birth of Asha heralds a family epic masterfully executed by author Shanta Acharya. The novel follows Asha’s life from childhood to adulthood in 1960s India. Through rich descriptions, the setting is made vividly alive (and helpful back matter elucidates concepts for those unfamiliar with Indian culture), as Asha comes of age around pulsating festivals, abject poverty, and a strict social caste. Family dynamics are richly wrought from the beginning of the novel when tension is placed between father and mother. The place of women in Asha’s society is immediately established—daughters are welcomed only when the family line has already been secured by sons, as is the case in Asha’s family. The position of women in the society, from birth to arranged marriage, lays the foundation for the crux of the novel’s drama. The novel is laced with brilliant insights (“If you knew your weaknesses, you learned to protect yourself. Asha worked away at her weaknesses. No one taught her how to protect herself from her strengths”) and retains the feel of a classic coming of age novel and marriage plot, well-suited to the quotes chosen for its epigraph (including selections from Woolf, Austen, Lessing, and Eliot). Though hesitant as a child, Asha comes into her own in school. She grows to love studying literature and falls in love with a man over a mutual love of books, despite her parents having arranged a marriage for her. Asha’s struggles with a disappointed family and the reality of a marriage based on love rather than tradition and security offer a satisfying narrative of an independent woman who takes her own path to happiness. The novel offers a rewarding read for readers of traditional English novels in the vein of Austen and Eliot, and for those drawn to Indian literature, Acharya weaves a beautiful narrative set in the culture that does not linger too long to explain it, keeping the flow of the narrative intact. In this vein, readers of Umrigar and Mistry ought to take note.